Majorities across five Middle Eastern and North African countries agree that Russia, Turkey and the United States are all playing more important roles in the region than they did 10 years ago, according to a spring 2017 Pew Research Center survey. Overall, a number of influential powers in the Middle East are not seen in a favorable light. Roughly one-third or fewer view Russia (median of 35%) or the U.S. (median of 27%) positively. Within the region, views of Iran are particularly poor (14% favorable), though Saudi Arabia fares better (44%). Middle Eastern and North African publics also tend to rate leaders of other countries in their region negatively. A median of roughly one-third have positive opinions of Egyptian President Abdel Fattah el-Sisi and Saudi King Salman. Views of Jordanian King Abdullah II are similarly low. And very few view Israeli Prime Minister Benjamin Netanyahu favorably, while a median of 12% have a positive view of Syrian President Bashar al-Assad or Iranian President Hassan Rouhani. Turkish President Tayyip Erdogan is the exception to the generally negative views, but opinion of him is still mixed. With respect to the ongoing conflict in Syria, publics are divided on how long they expect it to continue; a median of 26% expect the war in Syria to end in the next year, 32% expect it to end in the next five years and 29% think it will continue for more than five years. Overall, just 32% in Jordan are optimistic about the war ending in the next year, but 64% of Syrians living in Jordan expect the conflict will end in 2018. Additionally, on the issue of allowing Syrian refugees into their country, people in Jordan, Turkey and Lebanon are strongly in favor of letting in fewer, with many volunteering “none” as the best option. These are among the major findings from a Pew Research Center survey conducted among 6,204 respondents in Israel, Jordan, Lebanon, Tunisia and Turkey from Feb. 27 to April 25, 2017. Middle Eastern publics see both the U.S. and Russia playing more important roles in the region today than they did 10 years ago. 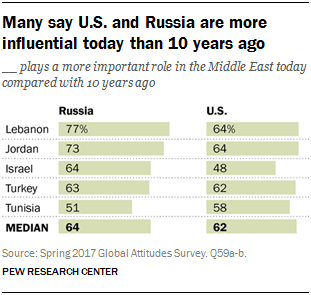 At least half in all of the nations surveyed say Russia is more influential now compared with a decade ago. Lebanon is particularly likely to say Russia’s role has grown, with Shia (81%) and Sunni Muslims (77%) sharing this view. Majorities in four of the five nations surveyed also say that the U.S.’s prominence in the region has grown in the past 10 years. A plurality in Israel agrees, although roughly a quarter each say that the U.S.’s role is as important (24%) or less important (27%) now. In Lebanon, Sunni Muslims (78%) are more likely than Christians (64%) or Shia Muslims (52%) to believe the U.S. has become more prominent. Within the region, many say that Turkey plays a more important role. People in Turkey and Jordan are the most likely to say Turkey’s role in the region has grown. Israel is the only country where a plurality says Turkey has lost influence over the past decade. This view is more common among Israeli Jews (45%) than among Israeli Arabs (29%). About eight-in-ten in Lebanon say that Iran is more influential in the Middle East today than it was 10 years ago. Large majorities across all religious groups hold this view: 89% of Shia Muslims, 77% of Sunni Muslims and 71% of Christians. The view that Iran now plays a less important role in the region is held by roughly a quarter in both Israel (24%) and Turkey (26%). More than half of Israelis and Jordanians say that Israel has taken on a more important role in the Middle East. And in Israel, Jews and Arabs are similarly likely to hold this view. By contrast, roughly three-in-ten in Lebanon (31%) say that Israel’s role has decreased. Across the region, fewer say Saudi Arabia’s role in the region has grown. Jordan is the only country where more than half hold this view, though a majority (61%) of Sunni Muslims in Lebanon say this. Only a quarter or fewer in Israel and Turkey agree. Few say that Egypt plays a more important role in the Middle East now compared with 10 years ago. Instead, at least four-in-ten in Turkey, Lebanon, Tunisia and Israel say that Egypt’s prominence in the region has waned. Overall, the Middle Eastern and North African nations surveyed have a very poor opinion of Iran and generally rate Saudi Arabia and Turkey more positively. Majorities in both Tunisia and Jordan espouse positive views of Turkey. Lebanese are split based on their religious views, with more than half of Sunnis and Christians but only 8% of Shias holding a favorable opinion. Similarly, Israeli Jews and Arabs strongly disagree on Turkey; 72% of Israeli Arabs but only 7% of Israeli Jews think well of Turkey. Many view Saudi Arabia negatively, but Jordan – which has deepened its ties to Saudi Arabia in recent years – has a very positive opinion of the neighboring kingdom. More than half in Tunisia agree. As with views of Turkey, Sunni Muslims in Lebanon hold significantly more positive views of Saudi Arabia than Shias. Opinions of Iran are remarkably poor. Fewer than one-in-five in Turkey, Israel and Jordan have positive views of Iran. Jordan’s extremely negative views are similar to views in 2015, but have soured substantially since 2006 – the first time the question was asked in Jordan – when roughly half (49%) viewed Iran favorably. Compared with its neighbors, Lebanon holds more positive views of Iran overall, but opinions are once more sharply divided by religious background; 93% of Shia Muslims in Lebanon view the Shia-majority nation positively, compared with only 27% of Christians and 16% of Sunnis. Publics in the Middle East tend to see Turkish President Tayyip Erdogan more positively than other Middle Eastern leaders. Yet, views of the Turkish president vary drastically across the region. Fewer than half in Lebanon and only 15% in Israel express a positive opinion of Erdogan. Israeli Jews (4%) and Lebanese Shia Muslims (7%) hold particularly negative views. Views of Erdogan have improved in Tunisia (up 10 percentage points since 2014) and Jordan (7 points since 2015). Lebanese views have become less favorable since 2015 (down 8 points). Middle Eastern publics have much more tepid views of Egyptian President Abdel Fattah el-Sisi. Israelis have the most positive opinion of Sisi among the countries surveyed, but Israeli Arabs (22%) view him significantly less positively than Israeli Jews (49%). Sisi receives the most negative ratings in Turkey, where only 12% view him favorably. Erdogan, the Turkish Prime Minister in 2013, publicly opposed the overthrow of Sisi’s predecessor, Mohamed Morsi. Saudi King Salman is generally viewed poorly, especially in Israel where only 14% hold a favorable view and no Israelis say they have a very favorable opinion of the Saudi leader. By contrast, 86% in Jordan view Salman positively and half view him very positively. Jordanian King Abdullah II receives ratings more similar to those of other Middle Eastern leaders. Views of the king are the least positive among Turks; only 18% view him favorably, but a plurality (43%) does not express an opinion. Views of Syrian President Bashar al-Assad are negative across all of the Middle Eastern and North African nations surveyed. Only 7% in Israel and 1% in Jordan view Assad positively. Syrians living in Jordan have similarly negative views of the Syrian president; only 3% have a favorable view of Assad. Views of Assad are more favorable in Lebanon than in any other country, but they vary starkly between Shia and Sunni Muslims in the country. A large majority of Shias (93%) and only 13% of Sunnis have a favorable opinion of the Syrian president. In most countries, ratings of Assad have been similarly low since the first time this question was asked. However, opinion has become more favorable in Tunisia over the past five years (up 13 percentage points since 2012). Opinions of Iranian President Hassan Rouhani are generally similar to opinions of Assad. Fewer than 10% in both Israel and Jordan hold a positive view of the Iranian president. Public views of Rouhani have become more negative in Jordan – 13% held a positive view of the leader in 2015 – but views in Israel have remained very low. Israeli Jews (0% favorable) and Israeli Arabs (22%) share low opinions of Rouhani. And in Jordan, both Syrians (1%) and Jordanians (4%) have very negative opinions of the Iranian president. Israeli Prime Minister Benjamin Netanyahu receives extremely negative ratings from nations in the Middle East and North Africa. Only 7% in both Tunisia and Turkey, 1% in Jordan and 0% in Lebanon have a favorable view of Netanyahu. And the negative opinion in Jordan and Lebanon is particularly intense; 95% of Jordanians and 97% of Lebanese say they have a very unfavorable view. In Lebanon, Christians, Shias and Sunnis have remarkably different views of the Middle Eastern leaders tested. Overall, Shias and Sunnis disagree the most, with Christians’ views falling somewhere in the middle. Shia Muslims in Lebanon hold more positive views of both Rouhani and Assad, compared with Sunni Muslims. Rouhani supports Assad in the civil war in Syria, as does Hezbollah, the Lebanese Shia-run militant group labeled a terrorist organization by the U.S. A Pew Research Center survey in 2014 found that a large majority of Shia Muslims in Lebanon held a positive view of the group. Sunni Muslims show the strongest preference for Erdogan, a 66-percentage-point difference compared with Shia Muslims. Salman, Sisi and Abdullah II – all leaders of Sunni-majority countries – are also viewed more positively by Sunnis than Shias. 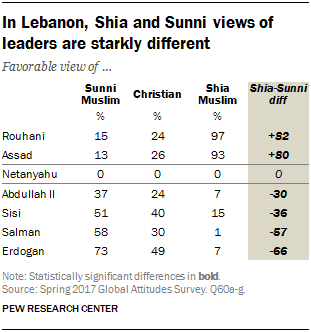 Netanyahu is the only leader whom Sunni and Shia Muslims in Lebanon view similarly; none of the Lebanese surveyed hold a positive view of the Israeli leader. The Syrian civil war, now in its seventh year, pits many of the region’s key players against each other. Few are optimistic that the war will end within the next year, though many believe it will not last beyond the next five years. Views are most optimistic in Jordan. Fully 80% expect the war in Syria to end sometime in the next five years, including 32% who think it will end within the year. Syrians living in Jordan are even more hopeful about the war in their homeland; 64% expect it will end within the year, 26% say it will end within the next five years and only 10% think it will continue for more than five years. Roughly two-thirds in Israel say the war will be over within the next five years, and 48% in Lebanon agree. Turks are the most pessimistic about the length of the civil war in Syria. Nearly half say the war will continue for more than five years. While the conflict continues, many in Turkey, Jordan and Lebanon want their country to accept fewer refugees. As of mid-2016, these countries and other neighboring nations have taken in about 4.8 million Syrian refugees. Only 8% in Jordan and 4% in Lebanon and Turkey support accepting more refugees from Syria. A majority in Jordan wants its country to accept fewer Syrian refugees and around one-quarter (23%) say their country should not accept any refugees (a volunteered category). However, Syrians already living in Jordan have very different views. A large majority of them say the country should accept more refugees from Syria and 0% say that Jordan should stop accepting refugees all together. In Lebanon, similar numbers say their country should either accept fewer refugees (40%) or none at all (42%). Christians are more likely than Shia or Sunni Muslims to say that Lebanon should not accept any refugees from Syria. Three-in-ten in Turkey want their country to accept fewer refugees from Syria and more than half say their country should stop accepting refugees entirely.